Yesterday, thousands of New York City public school students returned to their classrooms for another year. In their honor (and for the student in all of us), this month, we will be focusing on education at the Park. We asked our education department, Nellie A.V. Chaban and Emily Davidson, to write this month's newsletter and to share their approach to teaching at the Park. Below they give you an insider's look at a student field trip, provide a sneak peek of a new arts-making workshop, and offer you opportunities and ways to get involved. Over the next few weeks, be sure to check out our blog for more education stories from the Park! As the education department at Four Freedoms Park, we’re always thinking about new and innovative ways to bring President Roosevelt’s vision of the Four Freedoms to life. We consider his speech to be more than just an historic text: it’s a catalyst for continued conversation about freedom in our lives today and in the future. Guiding students through hands-on learning experiences at the Park, we strive to provide a memorable and thought-provoking experience, as well as thematic art-making projects that encourage positive civic action. 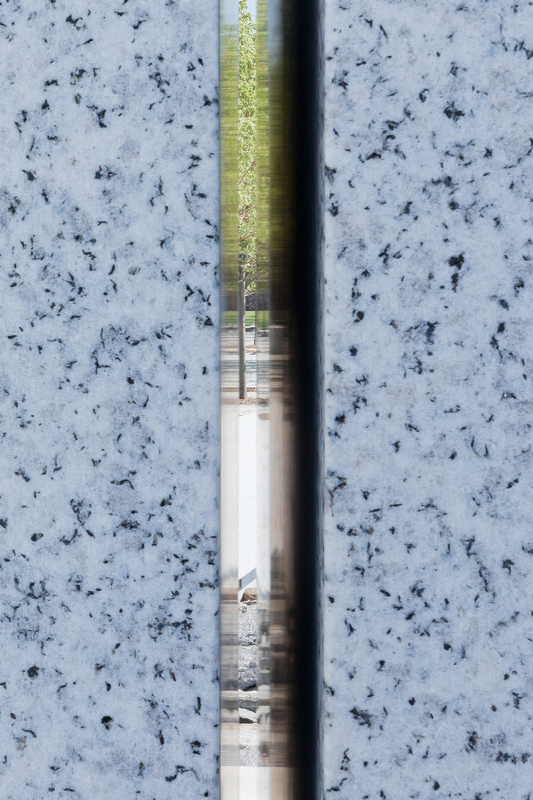 Architect Louis Kahn envisioned the memorial as being filled with what he called “inspired use.” Our student learning opportunities aspire to fulfill this vision. To that end, we offer a suite of hands-on guided visits and art-making workshops for students in grades 2-12. More than one thousand students from all five boroughs take advantage of these opportunities each year. Their field trips to Four Freedoms Park support learning in their social studies, English Language Arts, and arts classrooms. 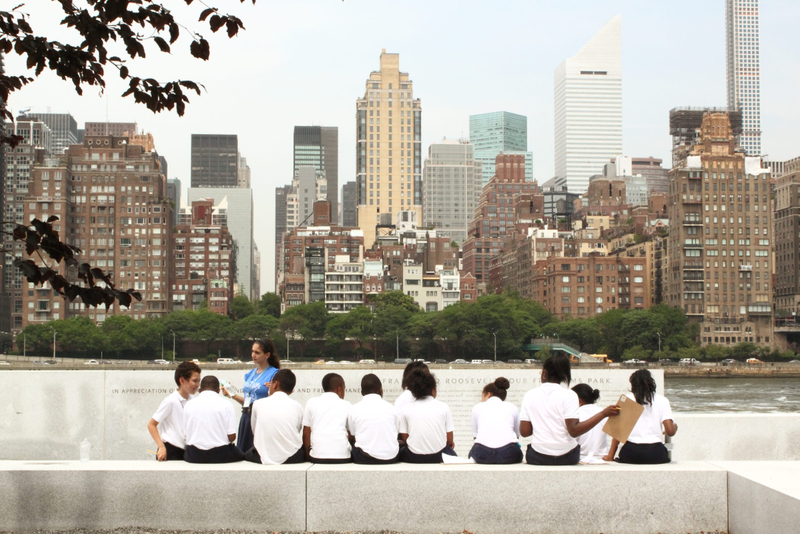 In this newsletter, we ask you to imagine that you are one of these students and to discover the many ways that we teach at Four Freedoms Park! Up the grand staircase, let’s pause to take in the view. What do you see? 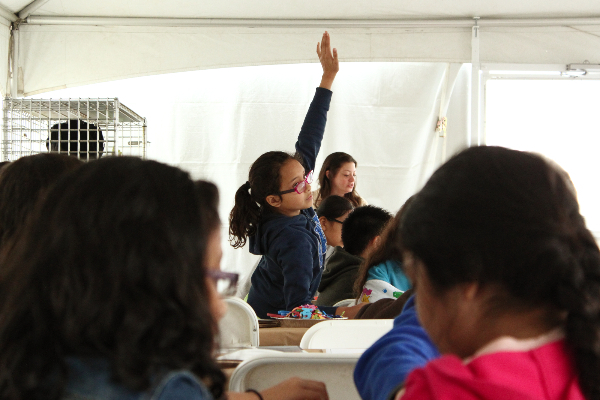 Our students are often eager to describe what they notice and are abuzz with questions about the Park’s design. So, we take a moment to investigate how Kahn commemorated FDR and his vision. 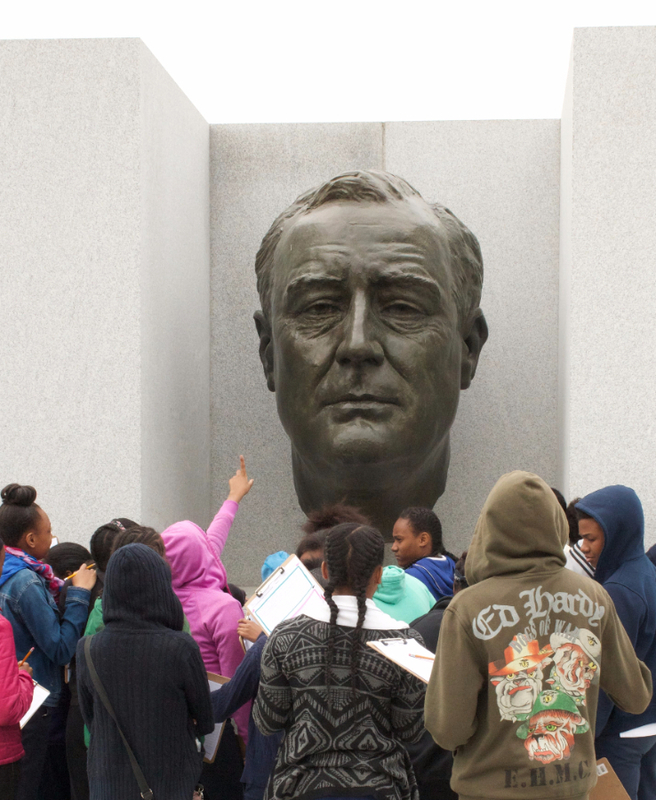 Students observe that a bust of FDR looks out upon us from just south of the lawn and notice that, as the Park’s focal point, all paths lead there. They seek out shapes in the geometric design and collect texture rubbings from as many surfaces as possible to learn more about the materials surrounding us. And, of course, they notice that the lawn is shaped like a triangle. (Or is it? Let’s take another look when we get to the bottom.) After we share our discoveries, students are eager to run. In the “Room,” the granite-walled space at the southern-most tip of the memorial, we discover an engraved excerpt of FDR’s Four Freedoms speech. Here, students interpret and connect with FDR’s vision of a “world founded upon four essential human freedoms.” They notice how different the “Room” is from the rest of the Park, often pointing out its serenity and peacefulness. Some even compare it to their room at home—a safe space for relaxation—while others spend time investigating the city from this new vantage point. As we head back to the Park’s entrance, we may walk north along the Manhattan side promenade. Like our students, you may be eager to share your own interpretations of the memorial and FDR’s words. Our student art-making workshops are designed with this goal in mind. Inspired by their visit to the Park, workshop participants share their ideas by creating an original work of art, a process that enables them to embody a leader (like FDR) or an architect (like Louis Kahn). This fall, our newest art-making workshop transforms visiting 4th, 5th, and 6th graders into comic book artists. During our Leaders and Superheroes workshop, students draw inspiration from FDR cartoons created by the US government in the 1940’s and compare these historic illustrations with fantastic works from the Golden Age of Comics. (Did you know Captain America was created in 1941, the same year as the Four Freedoms Speech?) Students will find surprising connections between FDR and some of our favorite caped crusaders; indeed, FDR presents Captain America with the shield that he later uses to fight the Nazis! 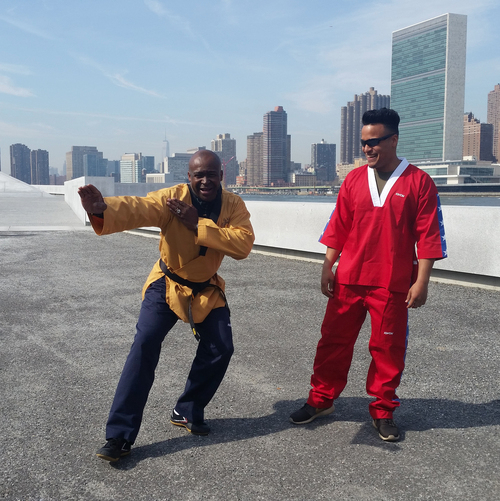 With Four Freedoms Park as the backdrop, students imagine what their superhero alter ego would be. Each student creates his or her own superhero stick puppet—complete with costume, helpful superpowers, and a compelling origin story. We hope you enjoyed our walk through Four Freedoms Park. We love sharing this special place with young people, who always surprise us with new observations and reflections on their trip. Four Freedoms Park Conservancy strives to provide low-cost, hands-on experiences for each and every class that approaches us. But we can’t do it without your help. Help us to expand our reach, purchase materials, and develop new curricula by donating to the Conservancy today. And, as always, please share our student learning opportunities with a teacher! P.S. Say “hi” next time you’re at the Park—we’ll be working with visiting students, and would love to hear from you! This class promotes focus, discipline, health, and well-being. Participants will learn basic techniques, while increasing their balance, circulation, flexibility, and energy. In recognition of the United Nations General Assembly and International Peace Day, visitors are invited to fly kites at the park all week long! 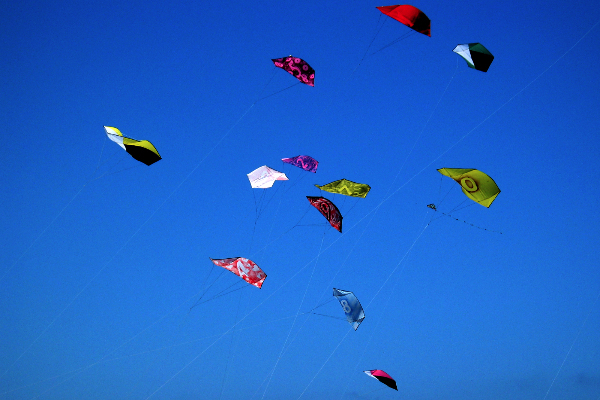 Design and fly your own kite at our drop-in kite-making workshop led by kite-maker Charles Stewart! These two workshops coincide with the public school holidays this week. Design and fly your own kite at our drop-in kite-making workshop led by the Conservancy’s Education Department! Then join us for an interactive kite-flying demonstration by Archie Stewart of the American Kitefliers Association. Our youngest visitors can channel Louis Kahn by building whatever they imagine with oversized, architectural blocks on the Lawn. Imagination Playground made possible by Amalgamated Bank the bank of Roosevelt Island. 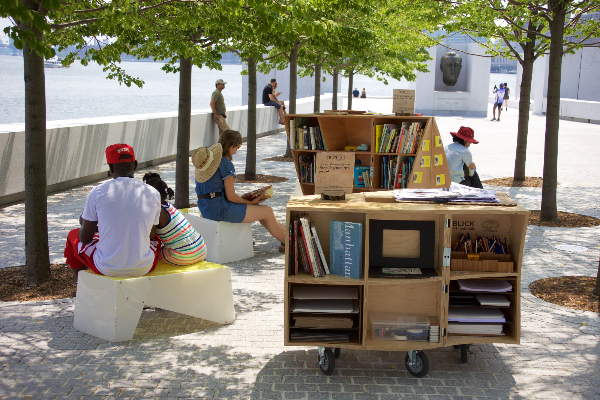 The Park will host the Uni Project, a pop-up reading room that creates community in public spaces. Come sit, read, draw, and explore a curated collection of books and hands-on materials. Explore Louis Kahn’s architectural masterpiece from behind the lens at this photography workshop led by Anya Hoyer. 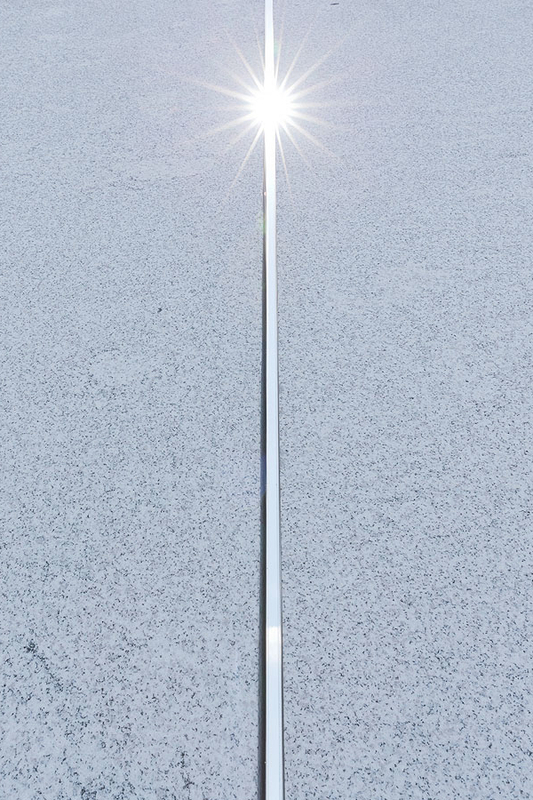 Experiment with light, shadow, and DIY filters to capture Kahn’s monument and the unparalleled views of the New York City skyline. Become a member & receive a 20% discount! Presented in association with Archtober, Architecture and Design Month New York City, October 2015. 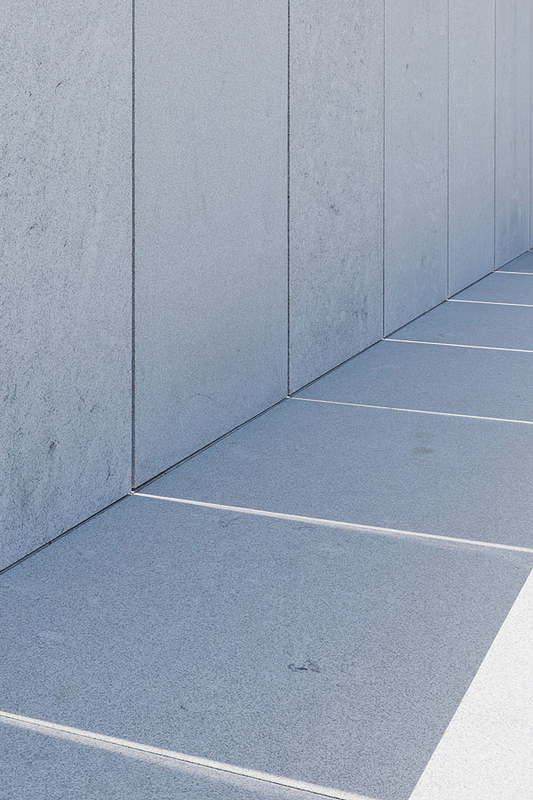 Join us for a one-hour walking tour of Four Freedoms Park as part of Docomomo Tour Day! Join Stephen Martin, Conservancy Director of Design and Planning, to discover the story behind Louis Kahn’s 1973 design and the decades-long effort to build a memorial to President Franklin D. Roosevelt on Roosevelt Island. Tour is FREE for members! Presented in association with Docomomo Tour Day. Explore the unique history and design of Louis Kahn’s architectural gem with a behind-the-scenes tour and a discussion of the New York skyline, as viewed from the Park. Registration details coming soon. This year, we are hosting two drop-in family workshops. 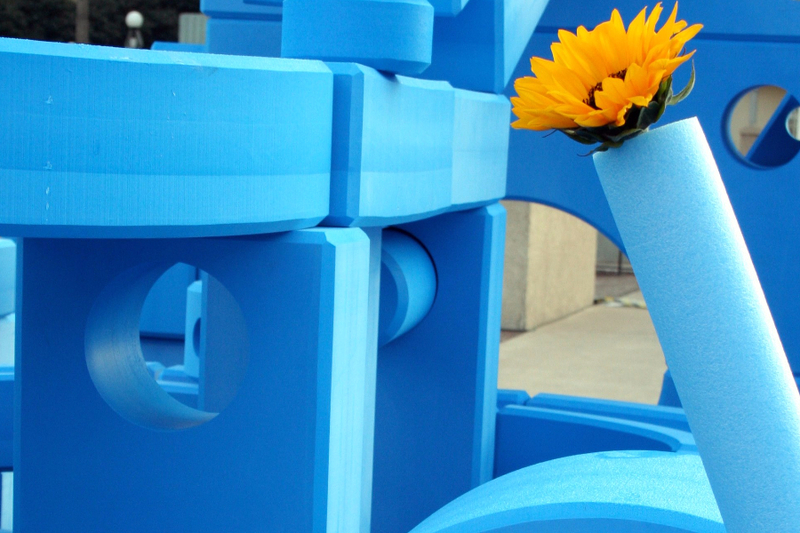 In the first workshop, kids can design blueprints for their own great building using LEGO blocks-as-stamps with paint. In the second workshop, CityScience will be offer hands-on demonstrations for families to learn more about the history and engineering of the Queensboro Bridge on the Park lawn by creating a human cantilever bridge. All ages welcome! Presented in association with OHNY. A quarterback, a bronco buster, a Revolutionary fife-and-drum corps leader, a sailor with inhuman strength, a doctor paying house calls, a boxer, a catcher, a lumberjack, and a man wrestling Tammany tigers. What do these people have in common? They are all cartoon depictions of President Franklin D. Roosevelt! Since before the birth of this nation, political cartoons have been used in a variety of ways: to express political ideas, gain support for a particular thought or movement, or depict a specific struggle or achievement. Throughout FDR's presidency, cartoonists were drawn to Roosevelt's charismatic leadership, the ways he spoke to and about his country, and his political philosophy. They depicted him as a superhero leader, a man capable of carrying the world on his shoulders. 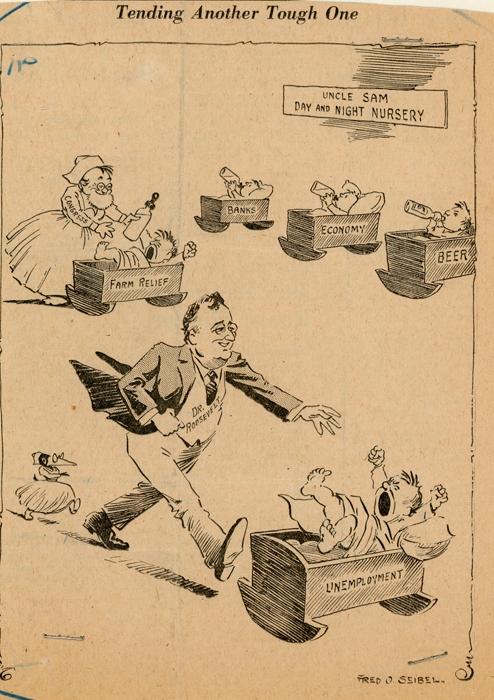 Read more about Roosevelt's depictions by cartoonists, his relationships with the press, and his fireside chats at fdr4freedoms.org's chapter, Talking to the People: FDR, Radio, and the Press. Photo: This cartoon by Fred Seibel appeared in the Richmond Times-Dispatch on March 23, 1933, just weeks after Franklin D. Roosevelt's first inauguration. Whether approving or critical of his policies, depictions of FDR tended to show him as a vigorous figure. In Seibel's drawing, a nondisabled FDR strides forth to address the troubles of the day, wearing his characteristic smile. FDR Library, Caption courtesy fdr4freedoms.org. Four Freedoms Park Conservancy is a 501(c)(3) organization. Contributions help to further the mission of the Conservancy and are tax-deductible as provided by law. A copy of our last filed financial report may be obtained by contacting us at 1110 2nd Ave, Set 301, New York, NY 10022, 212-204-8831 or by contacting the Office of the Attorney General, Department of Law, Charities Bureau, 120 Broadway, New York, NY 10271.